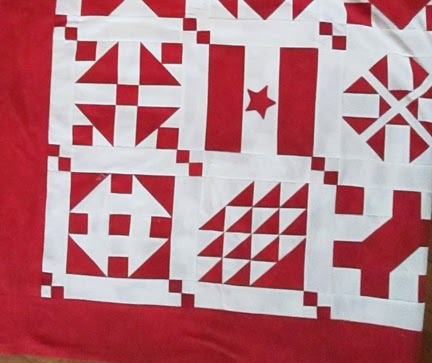 Georgann's finished her sampler and she says she has too many quilts. 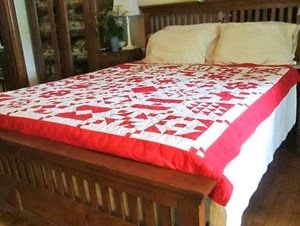 So we are auctioning off this red and white quilt to raise money for women's health issues. 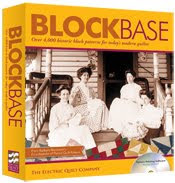 You may recall she made the red and white sample blocks for the block-of-the-week blog here. 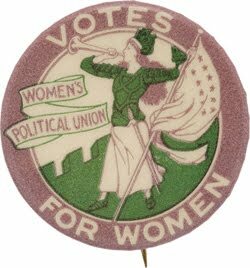 We thought this would be a good end to the historical journey we took through the fight for women's rights. The BIDDING IS OVER. EBW won it with a $250 bid. Georgann used the same speckled red print in every block contrasted with a plain white cotton. She made 36 blocks, 8" square. quilt on a queen-sized bed. 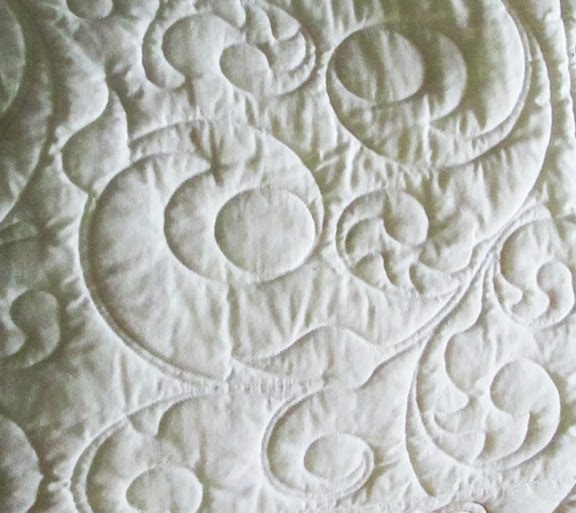 Kelly Cline quilted it on her long arm machine. It would make a lovely gift. How very generous of Georgann! 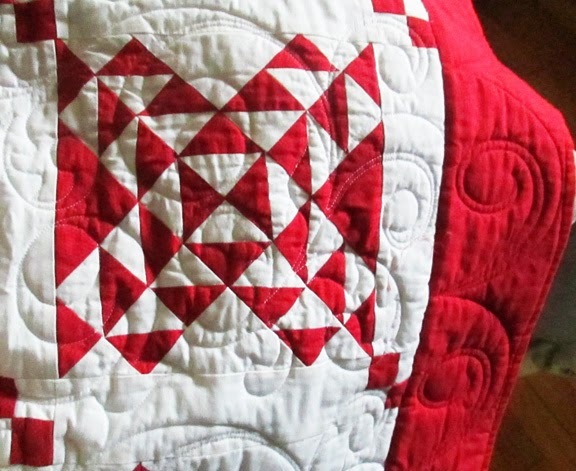 How does anyone have too many quilts? Haven't reached that point yet. 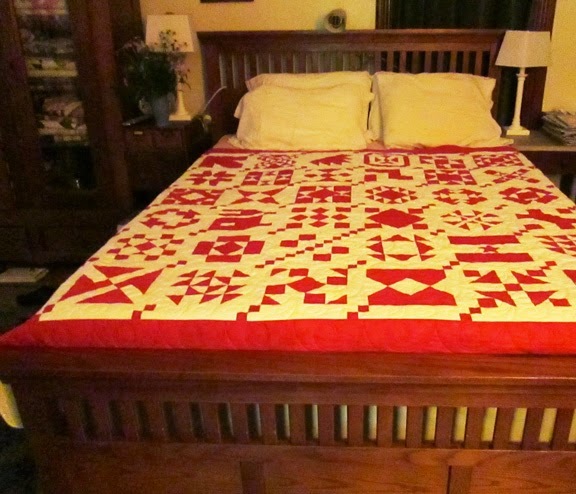 Love it, love the quilt and the generosity to donate it. Congratulations to the highest bidder, she has acquired an heirloom treasure as well as having made a fine donation. Brava! 49 Quilt Blocks in 2012 and 2013. Click on the picture to start with Block 1, posted September 1, 2012. I'll leave the posts up here past 2013. 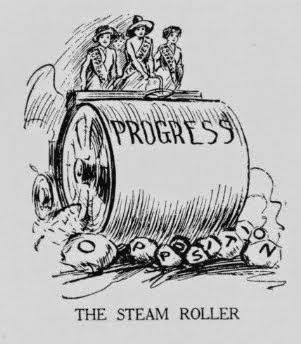 For our last look at "humor:" A pro-suffrage cartoon. 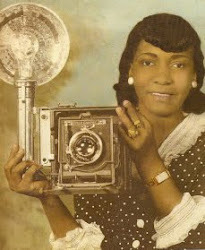 Post your pictures and check out everybody else's blocks by clicking on the photographer. 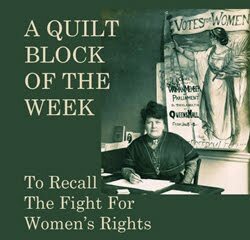 I have several blogs devoted to quilt and women's history. You may want a historic color scheme, one used in the early 20th century. In this side bar are suggestions drawn from the imagery of several prominent organizations. 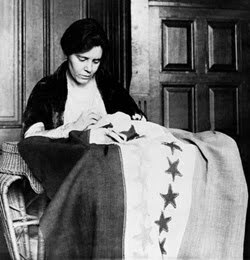 Click on the photo to see the colors Alice Paul used for her Suffrage Banner. Each week for 49 weeks I'll post a pattern for an 8" block. 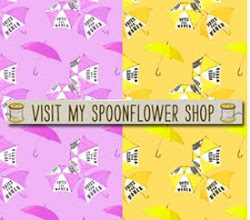 Click on the sampler plan to read more about yardage. 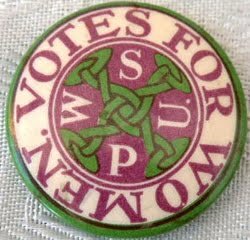 England's NUWSS used red and white, choosing the color of rebellion. 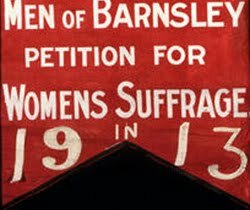 Click on the banner for a post about red and white. 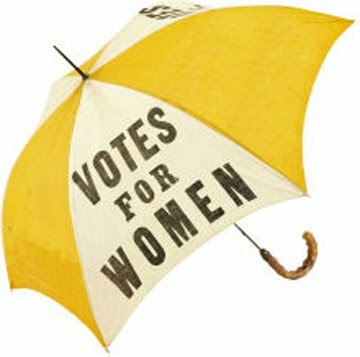 America's primary suffrage color was gold, often contrasted with black or dark violet. 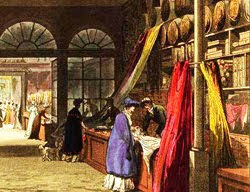 The shade is close to the yellow-orange we see in 19th-century quilts, the color the dyers called chrome orange and we call cheddar. Click on the picture to see a post on gold. 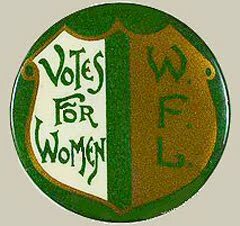 Australian suffragists adopted the colors of the Women's Freedom League: Green, gold and white. My digital program for PC's is the source for the names and the designs.Each week you'll get a BlockBase number for reference. Click on the box for more information. See this post for ideas on how to link to this blog for kits, clubs and classes.